For those that live in San Francisco (and the surrounding area), you know what Fleet Week sounds like. For those that don’t live around here, it sounds like incredibly loud low flying fighter jets buzzing the city for a couple hours each day for almost a week. Specifically it’s usually the Blue Angels practicing for their air show. Every year, Twitter and Facebook light up with either love or hate for these incredible technological marvels of human achievement built in the pursuit of an even greater military killing force. Regardless of your politics, they’re loud. 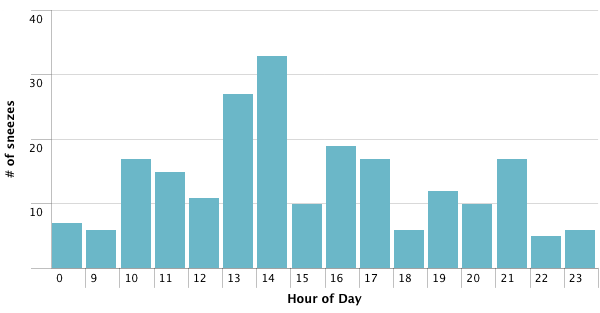 I’ve been working at Splunk on our cloud-based product, Splunk Storm, and have been finding new and different things to log and analyze with the service we’ve built. 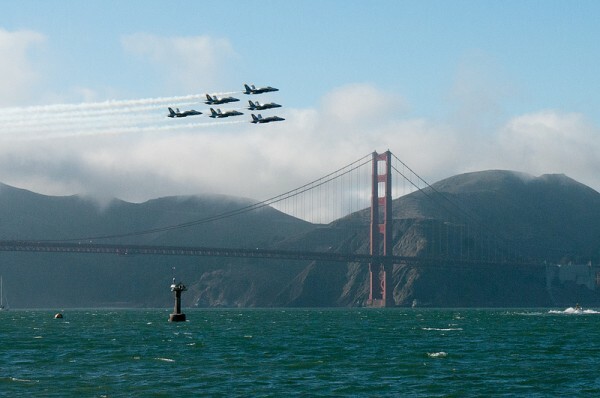 Shortly before Fleet Week 2012, Greg Albrecht came up with the idea of monitoring the roar of jet engines. He’s got a great write up of the whole side-project: Blue Angels Flyover Detection Using Splunk. I used a Raspberry Pi with a Zoom H2 Recorder that can be used as a USB microphone. I left it setup by the window with it streaming data to our shared free project on Splunk Storm. We wondered at first whether we’d be able to reliably detect the jets since we had no way of testing before Fleet Week. Surprised that none of my friends owned fighter jets? Yeah, me too. But as you can see from the screenshots on Greg’s page of reports generated with Splunk, they weres pretty easy to detect. I know the holidays are almost over (we still have my birthday!) but I had to share this video of Chris Marion’s latest revision of Fire Hero 3. I’ve been chatting with Chris off an on over the last 2 years about fire art, and how Interpretive Arson/Ardent Heavy Industries has gone about building and running our stuff safely and legally at events. He goes into great detail on how he built a lot of the system which includes six flame effects that react to guitar playing and two 100ft flame cannons for even more fire. All the plumbing and accumulators are controlled by an Arduino Mega and a RaspberryPi with a custom built server and communication protocol (written in python). The Python host software is made up of a series of algorithms designed to perform intelligent chord-detection, as well as detect single notes and place them appropriately. The software memorizes all the chord progressions of a particular song as the guitarist plays in order to ensure consistent output for each chord. The system is designed specifically for live music performances. I’m hoping it gets booked for a show nearby so I can check it out in person. Anyone that’s peeked into my music collection knows I love DJ Shadow. And if you follow my Flickr stream, you know I spent Monday night checking out Omega Recoil’s test of their tesla coil and that I dig tesla coils. What happens when you combine the two? Pure awesomeness. More info on Arc Attack, the people behind this, over on Doc Pop’s Laughing Squid post. Oh, and they also cover Dr Who. We’re all doomed if they ever become sentient and pissed off. MikroKopter – HexaKopter from Holger Buss on Vimeo. File this one under “Amazing Things I Want”. The HexaKopter is the product of some brilliant Germans and is a partially autonomous helicopter * 6. In addition to being remote controlled, it has several modes that allow it to operate on it’s own. It can maintain a GPS position, go into elevator mode (straight up in the air and maintain that height), and even return home on it’s own. In addition it can handle a 1kg payload, and takes some great aerial video and photos due to it’s stability. Besides looking like an incredible amount of fun to fly, there’s also a list of “SeriousUseCases”. The best part? You can make your own. all the plans (with photos!) are on their wiki and you can buy a kit. I love Tetris. If I had to count the number of hours I’ve spent playing this game, I’d probably exceed sys.maxint. Although in all those hours I never played it this way. Multitetris is a Python-based version of the classic game that allows for multiple players on a large multitouch console. It bends the rules of Tetris with new features such as the ability to steal pieces (actually reaching over and taking them) from other players, transporting pieces to empty spots, and looks like a couple of new shapes just to mix things up. Multitetris was written by Ping at the 26C3 hackfest, with most of the code being finished in the first day! In the video above you can see it being played on c-base‘s multitouch console in Berlin. Ok, one last warning! 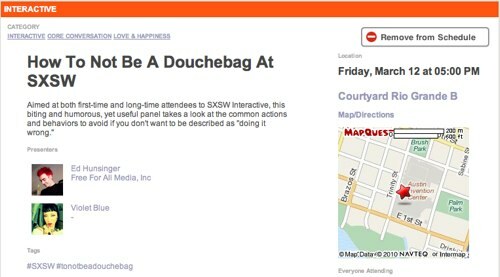 Our “core conversation” on How To Not Be A Douchebag at SXSW is only a few days away. Violet Blue, John Adams, and I (along with insight from Ben Metcalfe) have put together what we think will be a a great panel. We’re scheduled for Friday, March 12th at 5pm in Courtyard Rio Grande B. Come early to grab a seat as 99 people have already said they’re coming! Official page is over here if you want to add it to your schedule on my.sxsw.com. SXSW Interactive 2010 is only a few weeks away. If you’re like us, you’re still procrastinating on buying plane tickets to Austin. If that’s the case and you’re flying from either San Francisco or Los Angeles, then you’ll want to book the following flights on Southwest. We’ll all meet up in Las Vegas for the second flight to Austin. If you’re flying in from somewhere else on the west coast, look to hook up with Southwest Flight 718 from Las Vegas. Thanks to @dotBen for starting this idea. He’s even got a Google Spreadsheet going with who will be on the plane and some FAQ. 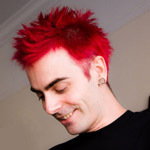 Dave McClure has also setup a Plancast. I register a lot of domains. In fact so many ( around 285 286) that I have my own disease. I generally use DomainSite and recommend them (even though they don’t have an affiliate program). They’re simple, to the point and don’t have all the unnecessary bells and whistles. Plus they have bulk update tools which are essential for me. Only thing they don’t have is auto-renew, but I have domains to renew every month, so it’s just part of my monthly workflow. But this post isn’t about DomainSite, it’s about Go Daddy. I don’t like Go Daddy. Plain and simple. I feel like they take advantage of people that perhaps don’t know much about domain registration, don’t care about customers, and have a bad reputation based on past behaviors. They’re famous for their upselling and the pushing of features you don’t need. 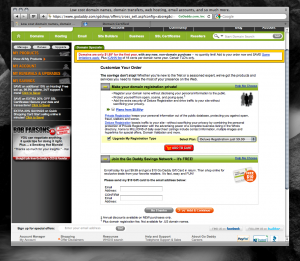 It had been awhile since I’d actually checked out GoDaddy before swearing to never use them again, so I figured I’d give them a visit to see how they were these days. Nothing’s changed. Ed Note: Why in the world is this page so unbelievably busy?! 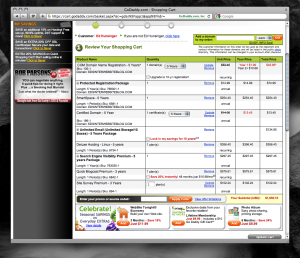 GoDaddy’s use of “hot chicks” to sell domains and services just feels dirty. Wanna read a post where someone analyzes their poor UI? 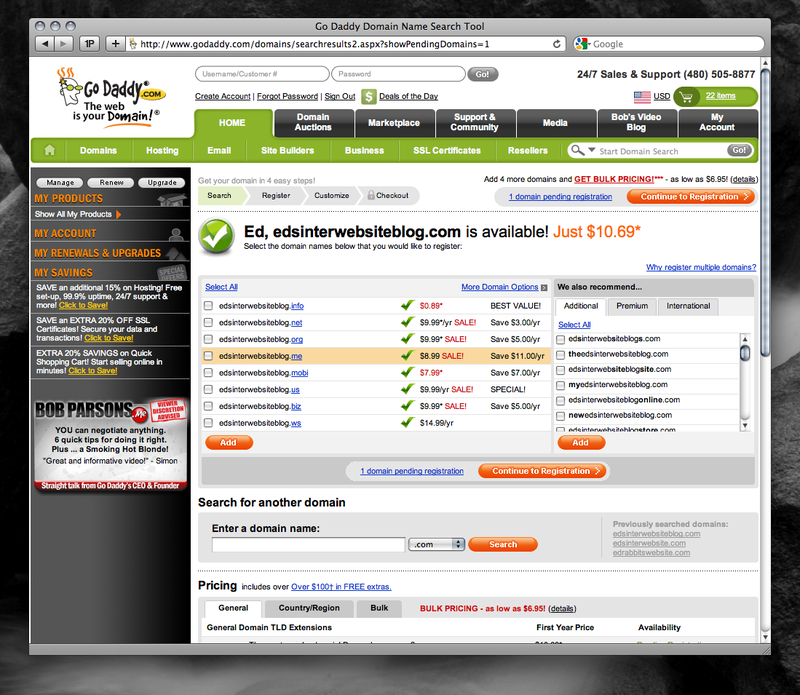 After clicking “GO!” I’m greeted with the exciting news that “edsinterwebsiteblog.com is available! Just $10.69*” Great, that’s really affordable! Let’s get it. I’m smart enough to know that I don’t need all those other domains like .net, .info, etc. So I select edsinterwebsiteblog.com and add it to my cart and click to continue my registration. Oh noes, popup! 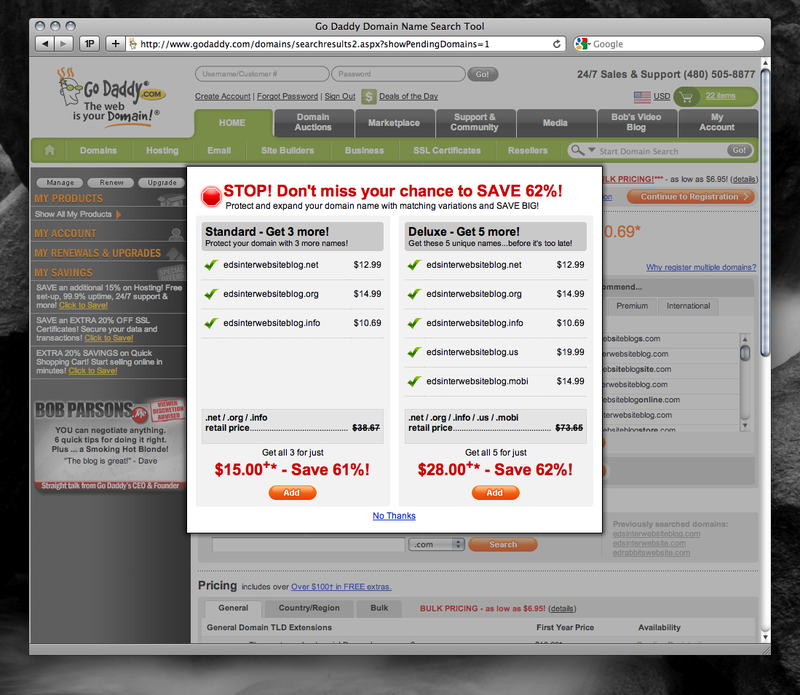 Go Daddy says I could save money if I get a bunch of other domains. That’s silly, I know this trick. I click the little “No Thanks” at the bottom. Ed Note: Nice touch of making the “No Thanks” a link rather than something people are more inclined to click, like a button. Normally at this point you’d be asked to create an account with Go Daddy and provide all your info and whatnot. For the sake of brevity and privacy I’m just using my pre-created account and skipping that part. Registration Length: That’s great, 5 years for $10.69 sounds awesome. 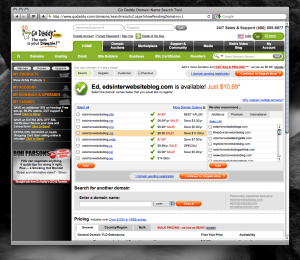 Certified Domain: I really want people to take edsinterwebsiteblog.com seriously, I should get it certified. It’s only $2.99 per year, that’s not that much. Ed Note: What the heck is a Certified Domain? This “certification” is something that Go Daddy issues themselves. They are basically certifying that the Whois info is correct, which is a requirement of ICANN for ALL domains, not just certified ones. Add Hosting: Oh, yes I need hosting! Deluxe is only $1.90 more than Economy? Check in the Deluxe box for $6.64. Add Email: Go Daddy says I “will benefit tremendously” from having multiple addresses/mailboxes. Unlimited email address is only $2.50! Check. Ed Note: Now is the time to note that there are cheaper hosting and email alternatives (we’ll get to them). But more importantly is Go Daddy’s shift from yearly pricing to monthly pricing. — Private registration “Helps protect yourself from spam, scams, prying eyes and more by shielding your personal information from public view” – OMG, I need protection from spam, I’m sick of all those emails about making my love machine last longer. — Business registration – Well, I’m not a business, but it’s included in Deluxe which I’m already getting to stop the spam. 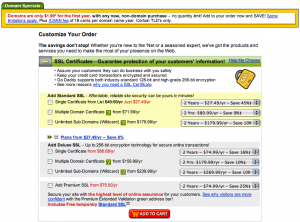 — Expiration Protection “Protects your domain against loss due to credit card expiration or failure, outdated contact information and more” – Oh man, my credit card is going to expire some day, I better get this or I might lose my domain! Guess I’m getting the Protected registration. — Deadbolt Transfer Protection “Protects your domain against any accidental or malicious transfer” – I’m not very smart and I have accidents, so I’m glad I have this. I have no idea what this means, but accidental and malicious sounds bad. It’s probably like rental car insurance so I’m glad I’m getting it with the Protected registration. Ed Note: I find it difficult to believe that Go Daddy charges for these features. – A Private registration is an acceptable feature. DomainSite charges 50 cents for it. 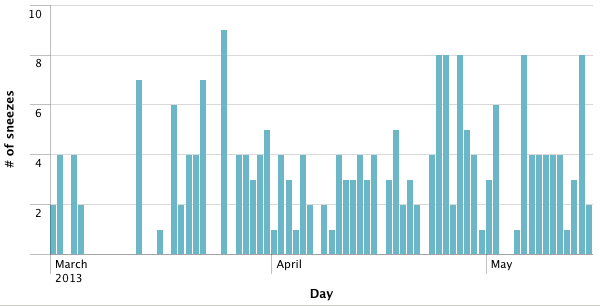 – Expiration Protection seems like a no-brainer that should be included by domain registrars. Do you really think they’re going to let your domain expire without notifying you to renew it and pay them more money? – Deadbolt Transfer Protection is basically locking the domain to prevent unauthorized transferring. This is a feature that all domain registrars should offer by default. DomainSite does. Also interesting is how when you Add one of these registration types, the page changes so that you can’t switch it back. 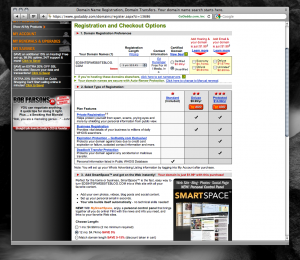 Add SmartSpace(tm) – “Perfect for the home or business, SmartSpace� is the fast, easy way to turn EDSINTERWEBSITEBLOG.COM into a Web site with all your favorite content.” That sounds great! I really don’t know anything about this AJAXHTMLPHPJAVAPAGE programming stuff. This sounds easy and it’s only $4.74. Added for the length of my domain! 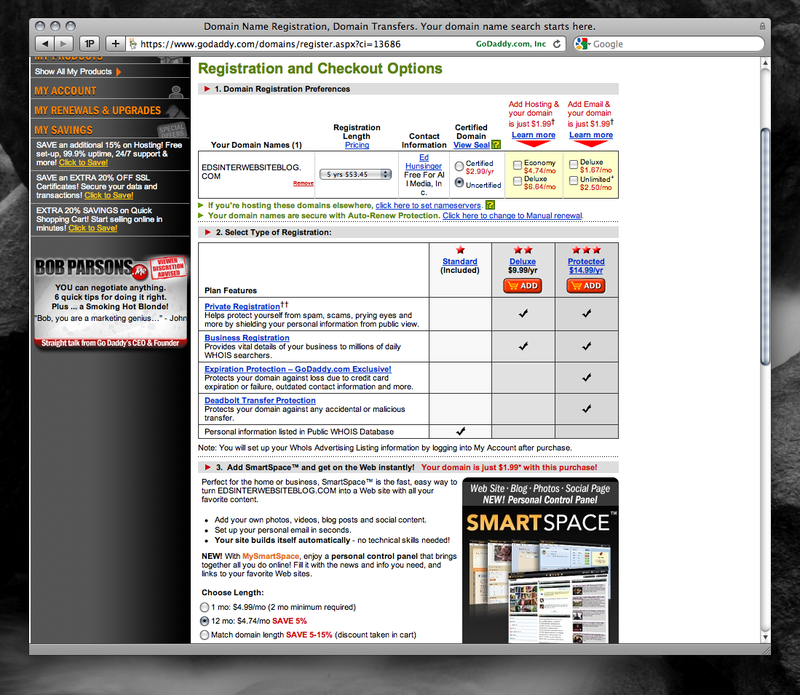 I click Continue and get excited that I’m almost done registering my new domain. Oh wait, I have more customizing to do? *sigh* Ok, what else do I need to do? Make your domain registration private! – Oh yes, this is easy, my sister’s boyfriend’s uncle had his identity stolen on the Internet so I don’t want my personal information out there. I definitely want private registration. I also want the Deluxe Registration because it “boosts traffic” to my site and I want everyone to read my site! I thought I had added privacy when I selected the Protected Registration, but I guess not. Adding Deluxe Registration for $9.99. Ed Note: Why is this being asked again? Shouldn’t this be included in the Protected Registration we already selected for $14.99? Clicking Add & Continue! Oh boy, even more customizing of my order! Let’s see, what do I want? 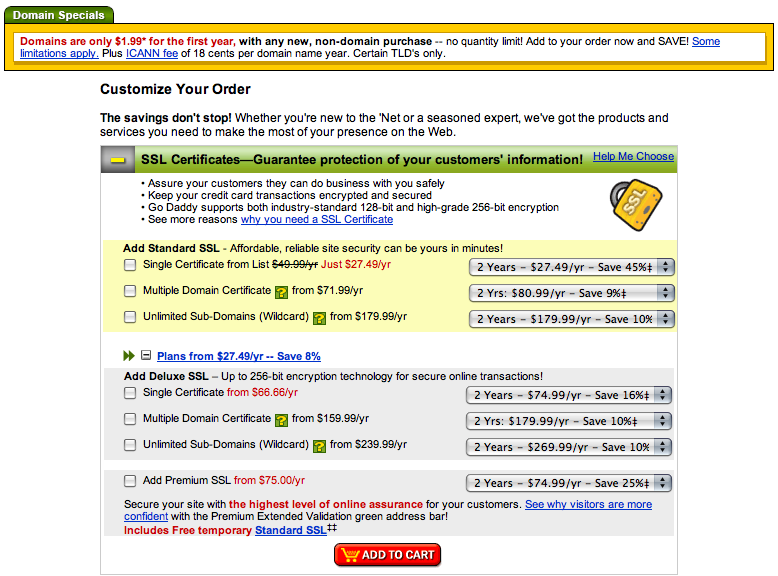 SSL Certificates – “Guarantee protection of your customers’ information!” – Well I don’t have any customers and this is expensive, so I guess I don’t need this. Whew, saved a lot of money. Drive traffic to your Web site and increase online visibility! – I really want people to visit my website! I should Add Search Engine Visibility, it’s only $25.49 per year if I add it for all 5 years that I’ll have the domain. 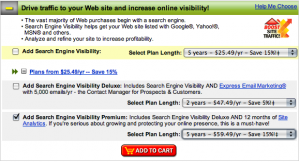 Oh wait, I can also get 12 months of Site Analytics if I go with Search Engine Visibility Premium. Let’s do that. It’s pricey, but you’ve got to spend money to make money online, right? 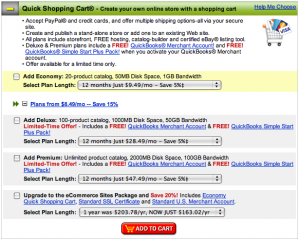 Quick Shopping Cart – I’m not going to be selling anything on my site, so I don’t need this. Join the Go Daddy Savings Network – Hmm, I enroll for $9.99 and I get a $10 Go Daddy Gift Card in return? Sounds great! Let me just plug in my email address. Ed Note: What is this? There’s no additional information on exactly what the Go Daddy Saving Network is. Do people really just blindly give their email addresses away like this? Oh, if you click on Help Me Choose it takes you to some additional pages where from what I can gather it’s an online coupon code site for members only. go Daddy says: “We�ve used our reputation as the world�s #1 domain name registrar to negotiate deep discounts for Savings Network members.” Huh, I didn’t know domain name registrar reputation had any pull with merchants. Oh wait, if by reputation you mean “ability to send customers” then it makes sense. 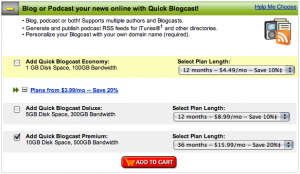 Blog or Podcast your news online with Quick Blogcast! – Oh, I want to blog, I guess I need this! 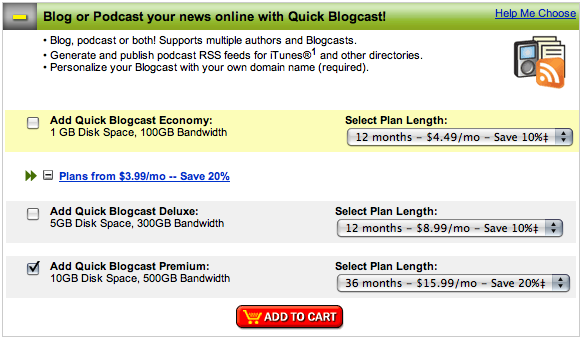 I plan on being very popular so I should get Quick Blogcast Premium since my harddrive is 500GB. Hmm, I can’t get it for 5 years like my domain, so I guess I’m just doing 36 months for $16 a month. Ed Note: Not sure exactly what this is, but I imagine it’s a combination of some scripts (probably WordPress for blogging) that setup a blog and/or podcast for you. 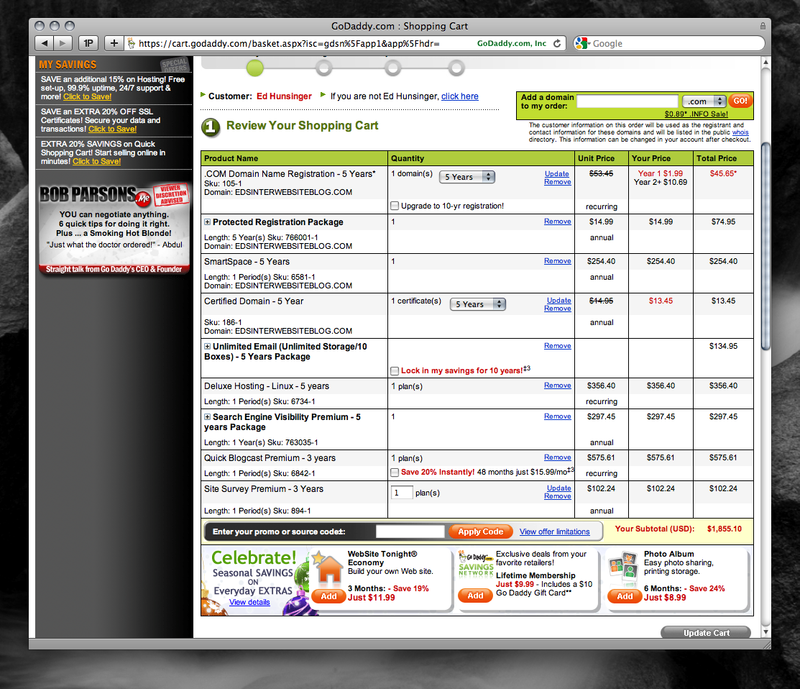 Plus this appears to be where you are specifying the amount of space and bandwidth you’d like for your site. To give some sort of indication, Dreamhost (a web hosting company) gives you unlimited space and bandwidth for $9-11 a month depending on length of contract. Go Daddy Site Surveys – Oh I love surveys! I do them all the time on Facebook to see what kind of Buffy character I am. I definitely want to be able to make my own. Nuts, no 5 year option, guess I’m going with 36 months again. It’s only $2.84, that’s like half a cup of coffee that I get every day! Ed Note: I imagine this is just a script install and database setup that should be a 1 time fee since there’s not really any upkeep to it. 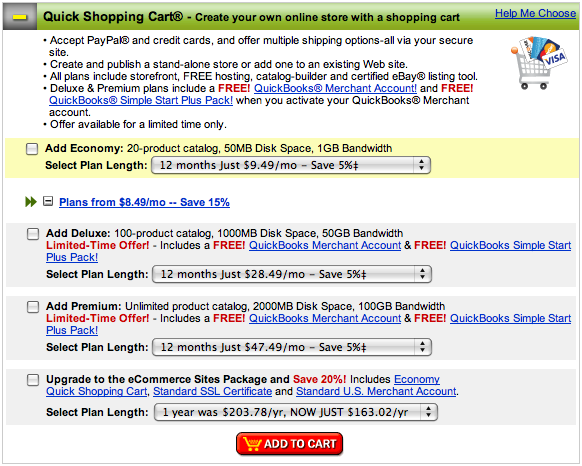 One really interesting thing to note on this page is that after you click “Add to Cart” for each option, it disappears! You’re not giving an option to modify your choice on this page. Ok, whew got those decisions made. I can’t wait to get started blogging and podcasting! Let’s click Add & Continue and pay for this baby. HOLY SWEET MOTHER OF !#$(*#%!#$)%&*$@^*$#!% $1,855.10?!?!?! On top of the simple used salesman sort of techniques, there are even more serious things to be concerned about with GoDaddy. Gordon Lyon setup NoDaddy.com to expose the behaviors of Go Daddy that should not be tolerated. Everything from holding domains for ransom, exposing personal information, and more.